Some of the best wildlife observations can be made from a canoe or kayak. As you move along silently, it may be possible to get close to birds, which would otherwise shy away from humans, or possibly even a Beaver or River Otter. As you glide past flowers, such as Pickerelweed, look for smaller wildlife like bumble bees, Tiger Swallowtails, other butterflies, and dragonflies. When canoeing or kayaking, take care in tidal areas; currents may be fast, forceful, and dangerous, and the water deep. Wear a life vest at all times. For tide information see local newspapers or click here. For your safety, follow canoe / boating safety rules when you canoe or kayak. For canoeing and boating safety see www.americancanoe.org, Top Five Tips; or Canoe Safety Tips for Kids. Take guided trips if you are not an experienced paddler. TAKE OUR FREE GUIDED TOUR! “To take our free upland and water trail tours, download the TravelStorys app from the AppStore or GooglePlay, or click here) to learn more. To download to your smart phone select “Paddling the Abbott Marshlands.” The tour begins at Bordentown Beach and concludes at Watson Woods near the Tulpehaking Nature Center. The tour is GPS triggered and will automatically play from your phone as you paddle. *Please take appropriate dry bags to prevent water damage to your phone in case of submersion. * On this tour, you will paddle past the historic D&R Canal, the site of Joseph Bonaparte’s Point Breeze Estate, and bluffs that have sustained human life for 13,000 years. 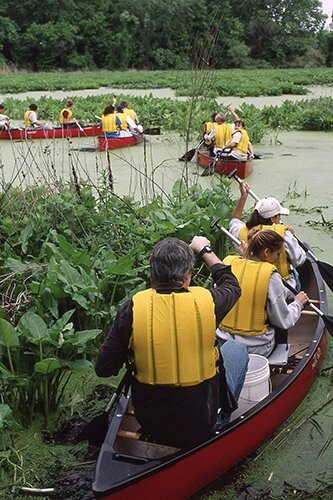 The diverse habitats of the Abbott Marshlands are key environments where you can encounter more than 730 species of plants, 234 species of birds, and many fishes, reptiles, amphibians, and mammals. Keep your eyes peeled for sunning turtles, swooping bald eagles, and swaying stems of wild rice. The marsh has an immense tidal range of 9 feet, so make sure to check the tide charts before heading out on your journey! The timing of Bordentown tides are about the same as Trenton and there is a delay of about 1 hour for Watson Woods. Note: Don’t forget to check out our upland tour too! The upland walking tour can likewise be accessed through the free TravelStorys app.